Notice the following statements made by the Pope. Pope Benedict XVI says your life depends upon worshiping on Sunday. “Sine dominico non possumus!” “Without Sunday [worship] we cannot live!” Pope Benedict XVI declared during a mass on September 9 at St. Stephen’s Cathedral in Vienna. Warning against the evils of allowing Sunday to become just a part of the weekend, the pope said people needed to have a spiritual focus during the first day of the week, or else leisure time would just become wasted time. Sunday worship, he warned, was not just a “precept” to be casually adhered to, but a “necessity” for all people. This is a very stern warning given by YAHWEH, the Heavenly Father and Creator of heaven and earth, and the Savior, Yahshua Messiah. It seems that the Pope thinks it does not apply to him, because he says that life depends on you worshipping on Sun-day, the first day of the week. Notice what the Savior says before giving the warning inRevelation 22:18-19. Remember, you cannot add to, take away, or do away with any of the Inspired Writings of your bible. If you do, or if you follow the pope or any other religious leader, you are cursed with the curse of death, eternal death. The Savior said, “Blessed are those who keep His (YAHWEH‘s) Command-ments.” Now notice the Commandments He is speaking of; there are Ten. So Mosheh was there with YAHWEH forty days and forty nights; he neither ate bread nor drank water. And YAHWEHwrote on the tablets the Words of the Covenant, the Ten Commandments. Breaking these Commandments is sin. Practicing YAHWEH‘s Laws of Righteousness is how you get to know Him—His Character and His Love. Those who practice breaking even one of the Commandments belong to Satan. 8 He who commits sin is of the devil, for the devil has sinned from the beginning. For this purpose the Son ofYAHWEH was manifested; that He might destroy the works of the devil. 10 But the Seventh Day is the Sabbath of YAHWEH your Heavenly Father. In it you shall not do your work: you, nor your wife, nor your son, nor your daughter, nor your manservant, nor your maidservant, nor your cattle, nor the stranger who dwellswithin your gates. But the pope says, no! Let us practice sin by keeping the celebrating of the first day instead of the Commandments of the Kingdom of YAHWEH. Your bible says your life hangs on obedience to the Laws of Righteousness. Read it in another place. Again, these are the Savior’s Words. Sunday worship is not a Commandment. The pope is adding to the words of the Prophecy of this Book in open rebellion against the Laws of Righteousness that would bring you life eternal. The pope is actually causing people to sin and lose their reward of Eternal Life. Notice the curse that is pronounced upon him. Those who follow this deception have their sentence given also. If you practice transgressing YAHWEH‘s Ten Commandments, you have the following warning from YAHWEH. Verse 7 says to let no man deceive you. Any religious leader who persuades people against the Inspired Writings of the Holy Prophets and Apostles or Teachings of Yahshua Messiah is called a false prophet. Your bible tells you to have a Holy Convocation (gathering) at the Place YAHWEH chooses on the Seventh Day Sabbath of each week, and you will know that YAHWEH, the Creator, is the One Who sets you apart for Life. You are commanded to labor and do all of your work Sunday through Friday. But Saturday, the Seventh Day, is the Sabbath and on that day you are to have a Holy Convocation with YAHWEH and His Children. So who are YAHWEH‘s Children and where are they? In this, notice, they are identified. Keeping YAHWEH‘s Seventh Day Sabbath and His other Laws identify you as belonging to the Creator YAHWEH, Who Alone can give Life, other than Yahshua, to Whom YAHWEH gave Authority to Judge and give Life. For as the Father raises up the dead, and gives them life, so also the Son offers life to those whom YAHWEH wills. The pope does not have authority to give life. Satan cannot give life nor can those who belong to Satan. According to the Inspired Scriptures in your bible, he does not have life himself nor does anyone who follows his teachings. He does not have life himself, because he will not repent of practicing sin. Notice, your sins are not blotted out unless you repent and convert to practicing Righteousness, which is practicingYAHWEH‘s Laws. One of those Laws is to have a Holy Convocation on YAHWEH‘s Seventh Day Sabbath, Saturday. Check me out. YAHWEH named me and gave many Prophecies concerning me and His Last Days’ Established House of YAHWEH for this Last Generation. There is no life in what you (Pope) teach. The Lords you worship and the sun God you worship cannot give life. The Queen of Heaven, whom you serve, does not have life in herself, nor can she give life. The Inspired Scriptures show when Satan will die. The only promise of Life comes from the CreatorYAHWEH, and it’s promised only to those who will repent of sin and convert to keeping YAHWEH‘s Laws. Prophecy shows that the Vatican will not repent. In fact, it will soon burn in the great nuclear burning that is about to take place because of the religious system, to which you are tied. The system you lead changed Yahweh’s Laws and put the whole world into a state of confusion that you call freedom. Read the Prophecy for yourself. 6 This is what YAHWEH, the King of Israyl, and Redeemer, YAHWEH, says: I am the first, and I am the last, and except for Me there is no source of power! 4 For Yaaqob My Servant’s sake, and Yisrayl My Chosen; and I call you by your name (Yaaqob); and I surname you(Yisrayl), though you did not recognize that it was Me. Please notice verse 5, YAHWEH is the One Who strengthens me. The word strengthen in this verse is traditionally translated girded. Gesenius’ Hebrew and Chaldee Lexicon by Samuel Tregelles, page 27, shows this word meansteach, strengthen and clothed as with a garment. I know you are powerless to change the Vatican. I also know that you know that the wickedness that comes from the city that sits on the seven hills is great. Withholding the knowledge about sin, while you teach freedom of choice and make sin look desirable and acceptable is the evil that’s causing sickness, disease, confusion, violence, hatred and war. This was written by all of the Prophets and is foretold by the Two Witnesses in this time period. At this time, you, Benedict, stand as the false prophet spoken of Revelation 20:10 because you are the chosen leader of that church, chosen by people not by YAHWEH. But I am chosen by YAHWEH. 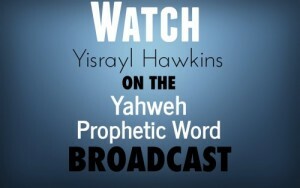 My Authority is the many Prophecies that YAHWEH inspired the Prophets to write about me. My job is to warn you and all the world of the sinful mess which you and your religous system have brought to this world. Notice now the Prophecy concerning you, unless you repent. I know the Vatican, as a whole, will not repent. But if you hurry, there is still time to repent and convert if you will humble yourself and come to the Place the Heavenly Father has chosen to place His Name. At YAHWEH‘s House you will find YAHWEH‘s Righteous Priests. They will take your confession and show you what you must do to have Life according to YAHWEH‘s Laws of Life. 12 The man who acts presumptuously, and shows contempt for the priest who stands to minister in front of YAHWEHyour Father, or for the judge, that man must be put to death. In this way you will purge the evil from Israyl. .You are the false prophet spoken of in Revelation 20. .The city that sits on seven hills is Rome and has brought forth the profaneness of the elders (priests, Pharisees, Sadducees, Essenes) now called Catholics, once called the “holy” Roman empire, but was far from holy. What is coming next is just what the Prophets spoke. These are the same Prophets who showed that the system you serve would destroy the temple and plow Zion like a field. You will soon see their Prophecies for the future fulfilled. A third part of mankind will be destroyed in the fourth part of the earth in and around the Great River Euphrates; but, the religions still won’t repent. They will keep the continual wars of Cain going until four-fifths of the earth’s population are dead. Notice the reason for all of this killing. Your religious system made the changes to YAHWEH‘s Laws and Name in its fight against the Saints. This system that you lead and follow has indeed brought profaneness to all the world. Soon heaven and earth will see the fruits of this system come to maturity in the most believable fashion that they will never forget. You have been warned. The choice is yours.